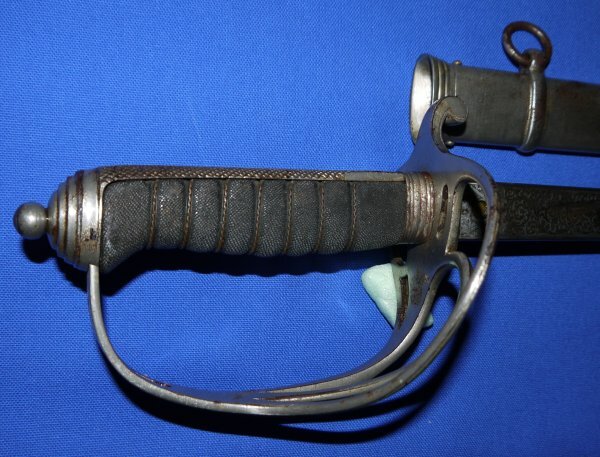 A British 1821P cavalry officer's sword but one that was made for by Wilkinsons for one of the few mounted infantry officers, a Lieutenant Armstrong of the 2nd Battalion of the The York and Lancaster infantry Regiment. In good condition. 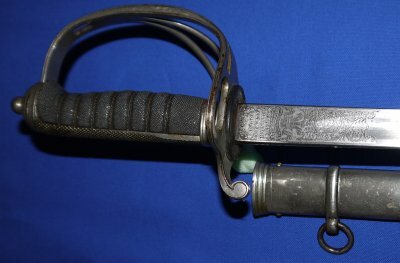 Rare only in that it was carried by a mounted infantry officer, rather than a cavalry officer, with correspondingly shorter than normal (for cavalry) blade. The Wilkinson sales ledger shows this sword was sold to Lieutenant Armstrong of the 2nd Battalion of the The York and Lancaster Regiment on the June 13th 1896. The 32 1/4 inch (infantry officer length) blade is in very good condition, except for some patina here and there, and is firm in the hilt. The hilt with some rust to the 3 bar guard, backpiece and pommel; the grip overall good. 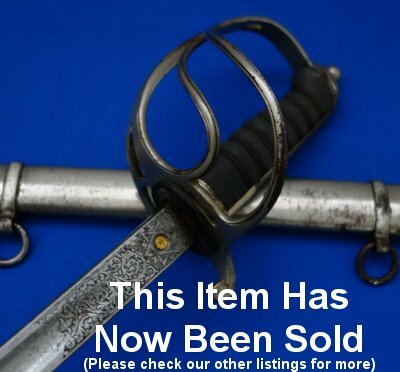 The steel scabbard in good condition but with wear and some rust spots. The sword sheathes and draws well. An interesting sword for anyone's collection. Please quote item reference K36 (1164). Further / full sized pictures available upon request.